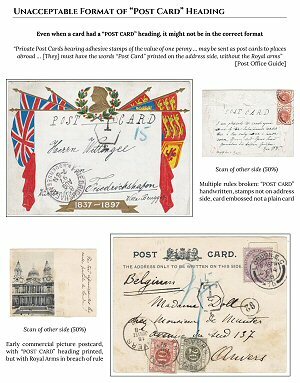 A reduced rate for "post cards" was first introduced by Austria in 1869 and in the UK in 1870, becoming part of the Postal Union requirements from 1875. There were however very specific rules about what actually constituted a postcard, some of them local and some international, with any breach meaning that the card was treated as a letter and rendered liable to surcharge (it would normally be insufficiently paid). This exhibit takes a look at cards that were rejected, or allowed to pass with extra payment required, for a wide variety of possible reasons. The date range covers the first half-century or so of the postcard rate. At first, only officially produced postal stationery cards were allowed at the postcard rate, whether Post Office issue or stamped to order. Cards sent abroad could only be posted to destinations that had agreed to accept them (e.g. part of the UPU). Plain or pictorial cards franked with adhesive stamps were eventually allowed, but subject to strict requirements as to format — they had to approximate the dimensions of the official cards, and be stamped in the correct way. If sent overseas, postcards had to be identified as such in a way that was internationally recognisable. Originally, messages could only be on the reverse of the card — the front was for the address only, with even a sender's name or address forbidden. This rule was gradually relaxed to allow part of the front to be used (driven by the popularity of picture postcards in the first few years of the 20th century), but could still be breached in extremis. Attachments to a postcard were originally completely forbidden. Again, this rule became more lenient over time, but there were still limits, and commercial novelties aimed to catch the eye of the public often went beyond them. Note: This display was an entry for the 2019 GBPS postal history competition, and won the Secretaries Cup for a promising entry. It replaced the "On the Cards" placeholder display that covered some of the same ground.